Life Size Severed Human Finger Prop Horror Prop Halloween Decoration by Blood Bay Props at HoldUp Art. Hurry! Limited time offer. Offer valid only while supplies last. Up for sale is one life size severed human finger prop. 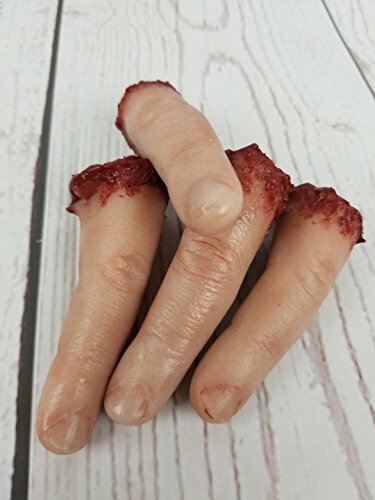 These fingers are great for a Halloween prop or a gift for a Halloween or Horror fanatic! Up for sale is one life size severed human finger prop. These fingers are great for a Halloween prop or a gift for a Halloween or Horror fanatic! These are not the low quality plastic fingers you will find in stores and other places online. Each finger is hand made from high quality platinum silicone and is hand painted for a crazy realistic look and feel! These fingers are hand painted so each one may vary slightly from the example pictures. If you have any questions about this product by Blood Bay Props, contact us by completing and submitting the form below. If you are looking for a specif part number, please include it with your message.